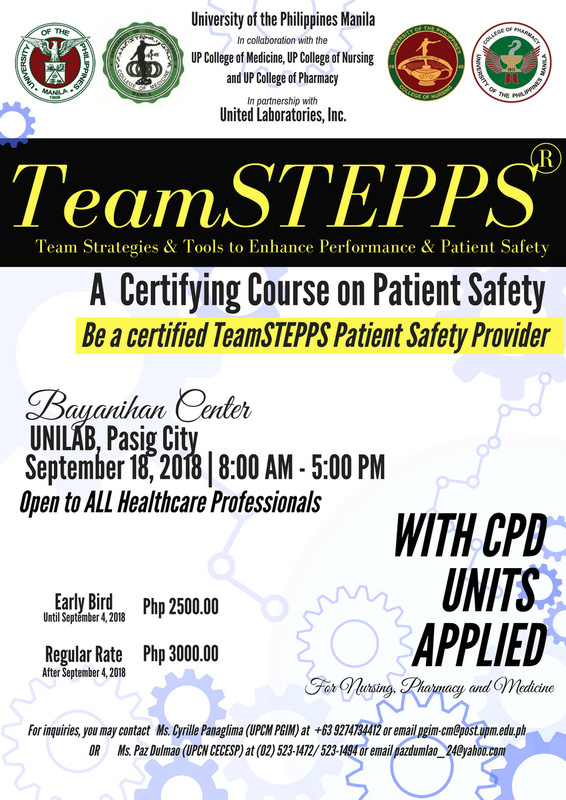 The UP College of Medicine, together with the Colleges of Nursing & Pharmacy, will be holding a Patient Safety Postgraduate Course entitled“TeamSTEPPS ® Foundations Certificate Course” this September 18, 2018, Tuesday, 8:00 am-4pm at the UNILAB Bayanihan Hall, Pasig City. We would like to invite your constituents to participate in this course and be certified Basic TeamSTEPPS Patient Safety providers. Patient safety is of utmost concern in any health care institution; hence, there is the need to provide this skill in a systematic and competent manner. Team Strategies and Tools to Enhance Performance and Patient Safety (TeamSTEPPS) is an evidence-based set of teamwork tools, aimed at optimizing patient outcomes by improving communication and teamwork skills among health care professionals. The TeamSTEPPS 2.0 curriculum is designed to help health care leaders develop and deploy a customized plan to train their staff in teamwork skills. Organizations report improvements after implementing TeamSTEPPS. The aim of this course is to train healthcare professionals in teamwork and communication strategies that can be applied in their respective settings to enhance patient safety. Attached is a copy of the description of the Postgraduate Course. The registration fee is Php 2,500. A discount will be offered to UP Manila constituents. Please contact Cyrille Panaglima, Postgraduate Institute of Medicine, UP College of Medicine, Telefax no. : (02) 536-1319, pgim-cm@post.upm.edu.ph or cspanaglima@up.edu.ph for any inquiry. PRC CPD units for the Council on Medicine, Nursing and Pharmacy applied.